As Olympic lifting continues its rebirth in popularity, there’s still a lot of confusion about injuries and teaching progressions. In this lecture, weightlifting coach Wil Fleming covers the most common injuries and how to avoid them, the most common errors of beginning weightlifters, his teaching progressions and how to prepare an athlete for Olympic lifting. Wil Fleming is a sports performance coach who specializes in explosive athletics. He’s the co-owner of Force Fitness and Performance in Bloomington, Indiana, where he trains competitive athletes. 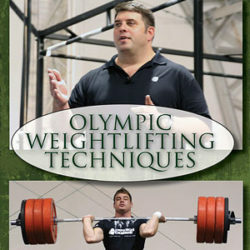 He’s the author of the IYCA’s Olympic lifting course, and his new O lifting DVD will be released mid-January. For more about Wil, visit him at wilfleming.com, and for information about his new DVD, including video clips, please visit completeolympiclifting.com.